We ll, July only means one thing in Knutsford…. The RHS arrives in beautiful Tatton Park and along with it an array of amazing floral works of art from Knutsford home owners, businesses and the community in general. The RHS judges head into town to view what the local retailers and business have done and have a little competition. This year the amazing Gusto Restaurant came first and we came second with an RHS Distinction! 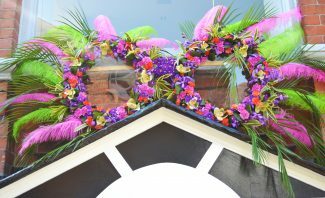 We were really pleased with the distinction and this years theme was ‘Carnival’ so our floral specs across the main door into the practice were Elton John inspired retro sunglasses with feathers and an amazing amount of floral detail. The talented team at Knutsford Bloom were responsible for making the vision a reality and are always a pleasure to work with. Thank you for all the lovely comments throughout RHS week, we had a great time and we are really happy everyone enjoyed such a lovely event in Knutsford social calendar! This entry was posted on Friday, August 5th, 2016 at 2:38 am and is filed under All. You can follow any responses to this entry through the RSS 2.0 feed. You can leave a response, or trackback from your own site.